The Kidney (renal) diet is complex and the thought of entertaining family and friends whilst sticking to your diet may seem daunting. Often, the only options appear to be a) preparation of two separate meals or b) to take a risk and not stick to your diet. Well, thankfully this is no longer the case. 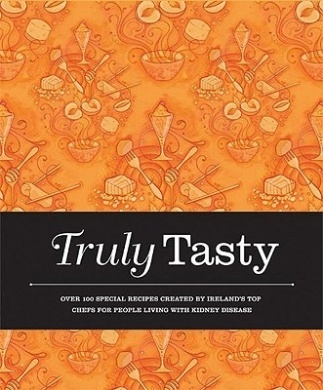 ‘Truly Tasty’ is a recipe book designed specifically for entertaining on a kidney diet has come to the Irish recipe book market. Compiled by Valerie Twomey, it contains over 100 special ‘kidney friendly’ recipes created by Ireland’s top chefs and analysed by Renal Dietitians from the Renal Interest Group of the Irish Nutrition and Dietetic Institute. Perfect for entertaining and with the feel good factor of ‘enjoyment whilst giving’ as all royalties from the sale of Truly Tasty go to the Irish Kidney Association, this is a recipe book that all who need to follow a kidney diet should dip into for special occasions and new ideas. Reproduced with permission from Valerie, the following recipe will give you a ‘taste’ of Truly Tasty and for more information please access www.trulytasty.ie. 2 level tbsp fresh parsley, chopped. Heat the oil in a large saucepan and gently fry the onions, celery and carrots until softened. Stir in the flour and cook for 2 minutes. Gradually stir in the chicken stock and bring to the boil, stirring all the time. Season with pepper and simmer for 10 minutes until the vegetables are tender. Add the cooked shredded chicken and heat through. Stir in parsley and serve ladled into warm bowls. Per portion: this dish provides 2 portions of vegetables and 5 protein exchanges (allowances). If you are on a fluid restriction remember to count this soup as part of your daily intake. Do not use a homemade chicken stock. Ask your Dietitian to suggest a suitable stock cube. Permission to reproduce this recipe was kindly given by Valerie Twomey, Editor of Truly Tasty.